Decorative ring handle. Removable bobeche. 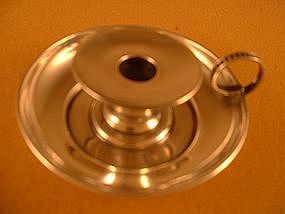 Diameter 2-3/4" (3" including ring handle). Height 1". Monogram: no, but a script engraved date on the bottom of Feb. 14th '89. Overall and mark condition are excellent.